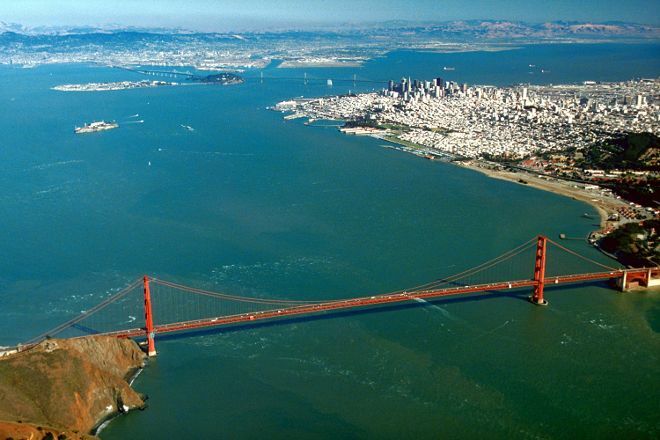 San Francisco sits on the tip of a peninsula, surrounded by San Francisco Bay, the Golden Gate strait, and the Pacific Ocean. To explore the bay's shoreline, walk, skate, or bike along the Bay Trail, which is paved within the city. To explore the region from the water, board one of many tour boats. Known for its strong westerly winds, the natural harbor is a mecca for sailors, windsurfers, and kitesurfers. The bay is also a natural nursery for native crab, halibut, and salmon, as well as being a key link in the "Pacific Flyway," a major north-south route used by migratory birds. If you want to hang out by the water, especially on a sunny day, join locals at Marina Green (30 hectare) 74 acre expanse of grass between Fort Mason and the Presidio. To visit San Francisco Bay on your trip to San Francisco, use our San Francisco attractions planner . This is one of the best places on earth. It is beautiful and I love the weather and how it changes so fast. There is so much to do and such a diversity of food and people. I have my favorite bakeries I go to in north beach. I have stayed all over the bay area and have never been disappointed. I live about an hour away and visit the bay area often. No disappointments visiting here. A place like no other. The San Francisco Bay is very unique, especially on the west coast. It's a natural harbor big and a great place to explore. There are many marinas and water related businesses. The Delta is also a fun adventure. Come boating but buy a TowBoatUS membership!